Matheus Lumber Company, Inc. is truly a global lumber supply company, providing products not only throughout North America, but also to Japan, China, Australia, and other Far East territories. At Matheus Lumber we have a long tradition of providing quality construction products and outstanding customer service to the North American building industry. For over 80 years, Matheus has offered personalized service from a team of professional wood product technicians who know the business and understand the products available today. As one of the last true lumber wholesalers in the country, our team can answer all of your technical questions, from span specifications and grade rules to species options. The company operates branch offices and supply yards in Woodinville, WA, Ellensburg, WA, and Post Falls, ID. The other regional offices are in Vancouver, WA, Portland, OR, San Marcos, TX, Phoenix, AZ and Mobile, AL. 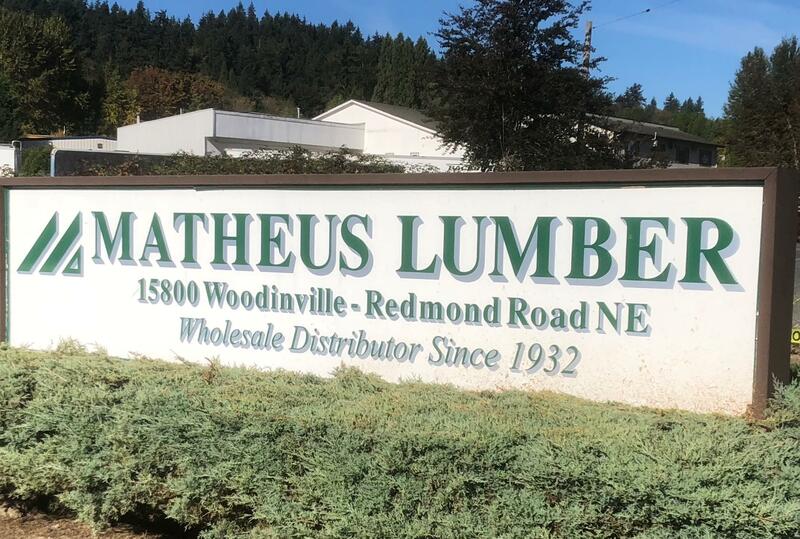 Matheus Lumber Company's headquarters and largest distribution yard are in Woodinville, offering deliveriies to projects throughout the Northwest. Export and the marine dock fabrication yards are also supported through this location. This location serves the local region as well as projects in Oregon and Northern California. Ellensburg is a full-service facility with a distribution yard that serves customers throughout Eastern Washington, including single-family builders and large apartment contractors. It also sells form board to concrete companies throughout the region. The sales team in Post Falls sells to contractors throughout the U.S., from Florida to New England and states in between. Its distribution yard provides lumber and other products to the Inland Empire region. The booming cities of Houston, San Antonio, Austin, and Dallas/Ft. Worth are the primary focus of this powerhouse office of lumber sales and distribution specialists. This office is one of the largest lumber distributors in the Southeast. Contractors in Arizona, New Mexico, and Southern California rely on the sales professionals in this office to serve their multi-family, commercial, school, and senior living projects. This new location is staffed with seasoned professionals who are focused on supplying lumber to the Oregon and California markets, primarily. This office shares space with Matheus Specialty Products which sells windows and other building components. Serving large contractors in the southeastern US, this office is rapidly becoming the go-to location for large apartment builders and commercial contractors. Within our region, Matheus Lumber has become well known for our ability to make prompt, competitively priced deliveries. Whether it's from our own distribution yard in Woodinville or from other yards with which we have reciprocal arrangements, we are able to extend our full-line of services and quality lumber products. Among our specialties are concrete form panels and lumber. Combining these two products allows us to be very competitive to job sites throughout the country. Working with over 1,000 sawmills across the U.S. and Canada, we can supply any job site with additional framing materials. Since building our distribution yard in Woodinville, Washington, we have expanded services to include the Pacific Rim regions and other world ports. Close proximity to Seattle and most of the major shipping lines enables us to load ocean-going freight and have them delivered to the docks in a timely manner.